The Gochipo mascot promotes U.S. pork in Japan. From left are National Pork Board (NPB) Vice President Steve Rommereim, NPB COO John Johnson, NPB Treasurer Brett Kaysen, NPB President Terry O’Neel and his wife Diane, USMEF CEO Dan Halstrom and NPB CEO Bill Even. 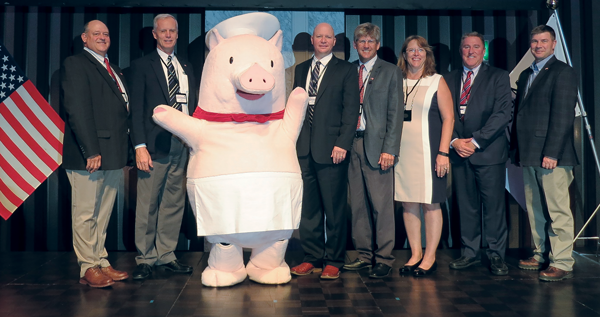 With a clearer vision on on how to elevate U.S. pork as the global protein of choice, National Pork Board officers and senior leaders recently returned from an Asian trade mission. Representing the Pork Checkoff, the team visited with pork processors, distributors, retailers, importers and traders in Japan and China. Asian team members of the U.S. Meat Export Federation (USMEF) accompanied the group. With the United States facing record-breaking pork production in 2017, the Checkoff is committed to growing demand, not only in the U.S., but also among top customers in Asia. In terms of pork volume, China/Hong Kong and Japan are the No. 2 and 3 export customers, with a combined volume of 534,953 metric tons (or about 1.18 billion pounds). In terms of pork value (U.S. dollars), Japan is No. 1 and China/Hong Kong is No. 3, with a combined value of nearly $1.6 billion of exports, both according to the most recent (through July) USMEF data. “Marketing pork comes down to building long-term relationships and having a safe, dependable, high-quality product that is presented well to the buyer,” said Pork Board President Terry O’Neel, Friend, Nebraska. Pork Board Vice President Steve Rommereim, Alcester, South Dakota, said, “China is a huge market in terms of volume and opportunity. O’Neel called the trade mission a great success. “Our leadership gained a greater understanding of the Asian market by visiting with people in the Japanese and Chinese meat trade,” O’Neel said. Including both muscle cuts and variety meat, U.S. pork exports have increased to 27.5 percent of total production in 2017, up from 25.6 percent last year. Developing Asian customer relationships and work with the USMEF and the National Pork Producers Council have helped make that happen. Look for a detailed report on the Asian trade mission in the next issue of this magazine.